When Carl Sagan and Iosif S. Shklovskii discussed travel to another galaxy in Intelligent Life in the Universe (Holden-Day, 1966), they considered the problem from the standpoint of the technologies then under discussion by theorists like Robert Forward and Robert Bussard. As I mentioned yesterday, the authors found hibernation interesting, drawing on the ideas of the Swedish biologist Carl-Göran Hedén, with whom Sagan was then in contact. But it was time dilation that took center stage in their book, and that required stunning velocities. To reach M31, the Andromeda galaxy, in a human lifetime would require a velocity of 0.99999 c.
Of course, there is no time dilation on the home planet. The elapsed time in years there approximately equals the distance of the destination in light years plus twice the time required to reach relativistic velocities. This time, at an acceleration of about 1 g, is close to one year. For distances beyond about 10 light years, the elapsed time on the home planet in years roughly equals the distance of the destination in light years. Thus, for a round-trip with a several-year stopover to the nearest stars, the elapsed time on Earth would be a few decades; to Deneb, a few centuries; to the Vela cloud complex, a few millennia; to the Galactic center, a few tens of thousands of years; to M31, the great galaxy in Andromeda, a few million years; to the Virgo cluster of galaxies, a few tens of millions of years; and to the immensely distant Coma cluster of galaxies, a few hundreds of millions of years. Nevertheless, each of these enormous journeys could be performed within the lifetimes of a human crew, because of time dilation on board the spacecraft. When I was first getting involved in interstellar studies and talking to as many people as I could track down with experience in the field, I had a phone conversation with Gerald Nordley, whose work I was familiar with in places like Analog. I remember an off-the-cuff remark Nordley made, that it would make sense for the first human expedition to Alpha Centauri to be conducted at .86 the speed of light. Why that number? Because if you can reach .86 c, the time compression factor is two. Your crew experiences half the amount of time that those left behind will experience. And that makes for an Alpha Centauri crossing of about three years, on the order of Magellan’s circumnavigation of the Earth. Of course, this is all so highly theoretical that it beggars description. How do you get velocities like that? We saw yesterday that while Carl Sagan had a deep interest in the work of Robert Bussard on interstellar ramjets (he described the ‘elegance in its conception,’ cited the fact that it violated no physical principles, and thought a Bussard ramjet could be built within a century), later studies have revealed serious flaws in the concept. In the archives here are a number of articles exploring ‘fixes’ to the original Bussard idea, and in coming months I’ll reprise these possibilities. Sagan also explored antimatter solutions but saw problems in manufacture and containment. In Martyn Fogg’s paper “The Feasibility of Intergalactic Colonisation and its Relevance to SETI” (citation below), having looked at the problems of the Bussard ramjet and pondered human life suspension, the author considers worldships as a non-relativistic way to reach another galaxy. Here the difficulties are likewise immense, with one concept (by Robert Page Burruss) involving a worldship a thousand miles wide carrying up to 50 billion people, to be sent on the ultimate generational voyage, one lasting hundreds of thousands of generations. As science author Adrian Berry notes, this is five times the past age of the human species. …because of the great length of time involved in an intergalactic voyage the problem of creating a closed ecosystem capable of supporting a viable population is far greater. The only self-contained ecosystem we have knowledge of that remains habitable over a time scale of millions of years is the Earth’s biosphere. Life flourishes under conditions maintained by atmospheric, chemical, geological and biological feedback loops, driven ultimately by sunlight and the internal heat of the Earth. A galaxy ship carrying a fully and continuously functioning ecosystem might thus have to be the size of a small planet and capable of carrying a powerful long term energy source. Which gets us to the most interesting part of the above description: A worldship the size of a small planet carrying its own long-term energy source sounds much like what Adam Crowl described on Monday, a small star and planet pair that can be flung out of the galactic core. Tomorrow I want to look at this idea — the adjustment of the trajectories of the stars themselves to migrate outward — as a non-relativistic solution to galaxy-spanning distances. The Burrus paper is “Intergalactic Travel: The Long Voyage from Home,” Futurist 21 (1987), 29-33. And here again is the Fogg citation: “The Feasibility of Intergalactic Colonisation and its Relevance to SETI,” Journal of the British Interplanetary Society Vol. 41 (1988), pp. 491-496.
within 1K years. If your colony crew is just cargo up until a colony infrastructure is built up by ship automation, then it need not be very large. even need to have shipboard life support at all. All you would need is automation to take care of the Sleeping pods. On arrival you can transport these pods to the surface and revive the voyagers groundside. But automation is not AI. Would you need an AI level controller to complete the mission? Or can something short of that do the job? topic. And he was Speculating about humanity a billion years from now. at any rate stories about such deep time, I think should have more of a feel of fantasy novel rather than Sci-Fi. The Burruss idea surely comes up against an extreme form of the problem pointed out by Van Vogt in “Far Centaurus” (1944): surely some later generation will find a faster way to do it, and will get there long before we do and colonise the place. Would we expect them to welcome our crew as equals? I don’t know, how would we feel about a starship full of chimps? “I admire still more than the saw-mill the skill which, on the sea-shore, makes the tides drive the wheels and grind corn, and which thus embraces the assistance of the moon, like a hired band, to grind, and wind, and pump, and saw, and split stone, and roll iron. Not so much theoretical as impractical, it works pretty well in particle accelerators. Triangular interdependence between energy, (space)time and mass. One solution is to reduce mass to reduce energy and thus time needed. Of course thats not a good solution for manned spaceflight, more for nanotech-probes as beamed propulsion riders (thats an external drive system, much like a particle accelerator). Breaking is of course a problem, not to say returning. Technically neither is an absolute requirement, however (employing quantum communication for an example). For large craft, technological advances like large scale antimatter production and containment (do we actually have to contain it in space? can’t we float it around the craft like some sort of a shield?) or a practical solution to the Alcubierre Drive (which involves even more exotic fuel; basically this exotic/antimatter is not without reason often referred to as ‘unobtanium’) it seems the only way to settle this is on increasing time to decrease energy need to accommodate the necessary mass. Facing certain limitations in energy at this moment we either have to deal with very long timescales or very small craft with beamed propulsion. But taking fusion reactors into consideration (which we have a little trouble with constructing) we are looking at a few hundred years flight from one star to another (updated Daedalus design). All in all it doesn’t look too bad. There are a number options emerging. The only idea I can think of is to beam the fuel as a thin stream ahead of the craft from stationary accelerators. The ramscope ship then picks up the ejected stream on its way out, fastest stream goes first (used last) then slowing down (used first), the ship then picks up the fuel, burns it and then moves up the stream accelerating. There could be many of these way station accelerators that eject fuel in streams to various destinations. If we chose the right atoms we could also punch holes ‘shock wave fronts’ in the gas/dust medium for these crafts to move through reducing damage potential to the craft and fuel stream before the fuel stream is ejected and the craft moves off. There is also the possibility of the ionised tunnel acting as a focus to other charged particles moving through the centre of it. Slowing down could be an even bigger problem than accelerating though, perhaps running into a fuel stream ejected decades earlier? Either way huge amounts of energy are needed! Isn’t Andromeda coming to us? Why not just sit back and wait a few Gys? Shkadov thruster is a more viable solution than Bussard ramjet. Also, I don’t see why the big fuss about the accumulated change on human physiology on large time scale. We all came from fish. Of course, all personal opinions. I am no expert, but the problem of traveling at near-c speeds seems unsolvable without technology for pushing the particles and space dust away from the ship’s trajectory. And traveling so close to c, it really needs to be nearly miraculous tech for ensuring nearly no atom or speck of dust hits the ship, transforming itself into deadly radiation or destructive detonations. This means that even if we could accelerate a ship at such light-hugging speeds, which seems impossible with known technology and physics, seeing for example the fuel/payload ratio requirements for an anti-matter thruster, we still have the problem of not being able to send anything alive or functional. Alas, this also applies to AI/software, because hard radiation is as bad for computers as it is for us, especially if we talk about nano-scale ones. It seems that without some really incredible breakthroughs in physics, fast intergalactic travel isn’t really feasible, even if in theory, time dilation would allow even human beings to survive the perceived length of the trip on-board the ship. But that leaves a lot of room for slow (non relativistic) intergalactic travel. Given the mind boggling distances to be traveled, way above interstellar ones (which are already perceived as incredibly hard), the idea of using small ships is not really practical either. In principle because the time spent on the ship would be nearly the same as in the outside, so travelling to other galaxy would take millions of years of perceived time too. No cryonic suspension or any other ship technology can be expected to survive that long. Nevertheless ships made of full molecular replicators that were smart enough to re-fuel and self repair using space resources could stand a chance, though, but that technology is also on the wild side of the speculative future. But certainly closer than actual intergalactic (and maybe interstellar) travel. So non-relativistic ships traveling for example at 20-50% c could do the trip, if they were made of bona fide self-repairing, re-fueling solid state nano-technology and AI. 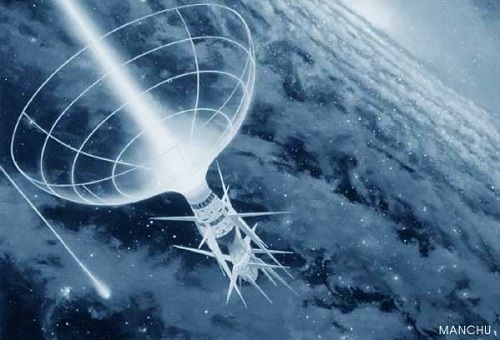 It’s envisageable that such contraptions would use the stellar resources for reaching the Galaxy’s border, and once there, use them once again to jump into the Void separating the galaxies with the bare energy supplies for surviving the trip, and kickstart its refueling/replication process again once at its destination. Such level of technology could also allow the ship to replicate itself and rebuild biological beings once at its destination, if it was made with such plan in mind, but I guess that printing out humans, plants and animals would be merely an aesthetic or philosophical choice at that point of civilization’s development. But for humans or any other biological beings, the trip would necessarily require much more time and resources. For beings like us, the bigger the ship the better due to ecological and survivability considerations (our planet is the only closed ecosystem that we know of that has survived for billions of years), up to the point where we would be traveling with our whole planet, not realizing we are traveling at all, just living our lives in countless generations and expecting that some far future generation would one day reach the long sought destination. There is also speculation of Kardashev level II stellar engines using the Sun’s energy to get thrust, displacing the star and the planets orbiting it with very slight accelerations. Reaching speeds of 20 m/s in 1 million years as per some of the existing proposals (the Shkadov thruster), which seems insignificant, but that would allow to traverse the distance to the galactic center in about 1 billion years. This almost unthinkable far future scenario could be done with other suitable star systems as well, so there could be a far, far future for us where groups of stars are slowly herded to a common destination (or several). Others have talked about some even wilder ideas, like using the galactic black hole as a slingshot for propelling a star at very high speeds (maybe one already being pushed there by a stellar engine in the first place), not unlike the known natural hyper-fast stars, but with much more deliberation and careful aiming, so the star and some planets could reach their far away targets in much less time than a Shkadov thruster alone would allow. Of course, these are things we most likely won’t ever see (not just us, but maybe anyone else in the foreseeable future). Even if they are feasible and one day real, actual technology, they would take so much to be done, as to make us wonder if they are worthy at all. We also have a lot of time for improving our understanding of physics here on Earth, or maybe living here in this same the Solar System, and even a few decades, centuries and millenia (not millions of years) ought to bring a few surprises on our understanding of physics and technology. 100 million cells can weigh about one gram. With each containing different DNA and with the technology to grow them at the destination using local resources, the in-transit energy requirements are drastically reduced. I remember clearly a story that appeared in Discover magazine probably now at least more than 13 years ago concerning the investigations on interstellar flight that were being looked at by Lawrence Livermore national laboratory. The article has always stayed in my mind because of the fact that they were talking about ships that had the masses of around 40,000,000 tons of antimatter would be required to make voyages. I don’t recall at all what the achievable velocities would be far such a massive vehicle nor do I recall the specifications regarding payload but at that time it didn’t seem unreasonable to me that such masses would be required. As a bit of an aside I do recall that in a lot of science fiction movies especially recently there have been pictures of vessels which are an enormous sometime on the scale of fractions of a large size city on earth so I do think at least from a Hollywood standpoint they do have some slight feel as to what would be involved for such a voyage. It has always been particularly bothersome to me that, given cost aside, everyone is startled about the mass ratios required for these voyages. I feel that these masses of fuel are not necessarily out of range for even a particularly energy level race such as ours. I say this because the fact that with such a massive solar body as our sun and with a dedicated construction of an antimatter factory he could produce antimatter as a relatively cheap item and that particular problem start to become less and less. Finally I’d like to add that I’m certainly glad Paul you have been writing recently articles about this particular topic it is quite engaging thanks. It would be great if Woodward’s ideas pan out–even if Warp Drive doesn’t work, and you’re limited to “only” sub-light velocities, perhaps you could still cheat and bring along one end of an “absurdly benign” wormhole, thereby enjoying the benefits of time-dilation without the drawbacks (as long as you avoid the whole Roman Ring situation). I’m putting my nickle down on the Warp Drive. Even if it’s only good for the 1st 500 LYs, it still is a promising concept. Just hitting 1 grain of sand at those speeds. Game over. On its lowest level of functionality organisms are nanotechnology. That’s what a microbe basically is: self replicating nanotechnology. One has only too look at how flagella operate or RNA Polymerase. These are not muscles but molecular motors. Those are molecular devices. Technically it not only seems possible it is also being already employed by nature. Yes, damage by radiation is an issue, but also there are mechanisms to migrate that SSB coating and various repair mechanisms we are just beginning to understand – aside of blunt shielding. I think its possible. To be perfectly honest i think its already happening. Hit it at a distance before it hits you! use its ‘relative’ energy to ionise and disperse it. The Milky Way is very big. What did Sagan say – ‘billions and billions’. I think given the massive size of the Milky Way, and the potential number of habitable exoplanets it might contain, there is ample room within our own galaxy to build a flourishing galactic civilisation that lasts aeons into the future. I’m not sure why we need to think about going ‘extra-galactic’. Sure, one day, in the distant future, we’ll look at M31 or the Magellanic Clouds, or the Globular Clusters and think about next steps after humanity is a galactic civilisation. But I think that’s millions of years into the future. I think he has the wrong end of the stick. That 20 m/s is only a maneuvering budget, the real velocity change is experienced by targeting the slingshot effect of other passing stars. That might be 20 m/s per encounter, and as we pick up speed, those can come every few thousand years. This myth lives on I see. Johnny Carson said b&b during his skits imitating Sagan on The Tonight Show. Sagan was quite irritated with the matter for a long time, though he said it in print in his last book, Billions and Billions: Thoughts on Life and Death at the Brink of the Millennium, published posthumously in 1997. Regarding your comments on not needing to visit/colonize other galaxies for millions of years: We assume there is plenty of room in the Milky Way galaxy for everyone to get along, but we know of perhaps a couple thousand exoworlds out of hundreds of billions and blessed little about that handful. The galaxy could be well occupied or at least annexed by ETI and we have yet to come across their versions of the No Trespassing sign. We will have to relocate anyway in a billion years or so when our star starts changing and makes things a bit too warm for life on Earth and definitely when Sol expands into a red giant star. Plus if you read Adam Crowl’s very recent article, whoever is living around here in the far future will have to consider moving to the Virgo Supercluster, so it doesn’t hurt to start planning now. There’s a ship out there without a name. Its been thought of by millions, conceived of, drawn, designed and re-imagined over and over. Some hold strongly to have thought of it first. Others profess to having built it. Others lay claim to the origins of the idea. This is a ship without a name. But we all know what it is, and where its going. Not discussed here is Gerald Nordley’s proposed method of propulsion to achieve 0.86c. It involves imparting momentum to the departing starship with a powerful particle beam, much more effective than a giant laser, and eliminating worry about the rocket equation altoghether. He also covers the avoidance of interstellar matter with a magnetic field for charged particles in the path, and a laser for the neutral ones. We’ll be looking again at Nordley’s ‘snowflake’ pellets in coming weeks as part of an extended series on sail technologies. My thoughts exactly, particle beams are better than lasers. Ionised particles with sufficient velocity will ionise neutral atoms as they move past them. An accelerated heavy or light proton rich element will exploded if it hits an interstellar gas or dust particle, it would act like a blow torch. To me the dust and gas are not the issue or obstacle to high velocity interstellar craft, it is the energy required to speed up and slow down the craft that is the issue. We only have to absorb or push aside a small amount of material, less than a ten of a gram or even less (depending on the interstellar medium density) per square meter to the nearest star. Michael, I am a bit confused as to how you prevent charge dissipating that beam, especially given that electrons and protons have very different masses, and thus (I’m guessing here) different degrees to which each of their beams can be pointed and focused. Do you mean the same charge of the particle beam? The faster they go the more collimated the beam is, time dilation effects. Electrons which are lighter will disapate much faster than heavier nuclei though. The positive ions will be going very, very fast, it is unlikely that electrons will get the chance to become attached to the atom again from the local interstellar gas as it is only around 10 000 K. However ‘braking’ radiation may occur as the ‘interstellar gas’ electrons interact with the positive charged nuclei which could cause divergence issues. However once they are out of the way the ions behind it will take their place. Michael, I can’t say I’m overly fond of unnecessary complications and, to me, relativistic focusing is one of those. In special relativity we can usually transform the situation back to a euclidean one, so lets ride on a charged particle in that beam to do exactly that. To begin, I point out that there is no Lorentz change to distances in the x axis, so the dispersion effect is just the same. On the y axis, that target (spaceship) is gamma times closer, and coming towards us at almost the speed of light, so that dispersion is the same for a static plasma over gamma times less its light distance. Approaching Alpha Centauri’s Oort cloud we would be about 100 million seconds away. Now, given a gamma of 1000, we have 100 thousand seconds of dispersion. Even laser light is had to focus over that equivalent distance ( = 200 astronomic units), let alone a particle beam! Now we hit 3.5 terra electron volts in the LHC in 2010, that is a proton with a time dilation factor of 3500 gamma, we could do a lot better on the moon or in space (energy/space). So would you agree that the dispersion will be 3500 less as time slows down in the moving frame of reference. Now the force between say two ionised protons 1mm apart will yield a final velocity of around 12 m/s. So normally (stationary) they would be (100 million x 24) m apart or say 2.4 million km apart, but if we are traveling at gamma 3500 the dispersion would be only be around 685 km, that is a huge difference. A laser with a divergence of 0.01 degree would be 100’s of millions of km in size. Particle beams have enormous potential not just to get us around the solar system but to the stars as well. Another great thing about them is that they have much greater momentum, that allows us to accelerate objects faster with shorter dispersion distances. Michael, protons have an abnormally low mass per charge ratio so, IMHO it is best to consider how fast deuterons can be accelerated when considering positive charge particles, nevertheless I will stick with your proton. Your figures are a useful start as they also give maximum temperature permitted in that cloud, and though it depends on particle size, using your proton, I find that the temperature of the plasma cloud can’t here exceed 0.005 Kelvin. For electrons it is far worse. Those same calculation of separation energies you gave indicate that it is not possible to prevent them spreading at 500 m/s. Since once they dissipate to far from the protons, the protons will repel each other even more, this must be a problem. Sure we can transmit electrons at a higher gamma, but surely two such very different velocity particles would heat things up a lot more than 5mK! We can go with neutron rich atoms such as lead or uranium to lower dispersion even more. We can pick and choose the atom we use and that offers a lot of advantages. That is correct as the temperature is dependent on the velocity and mass of the particles and I used it as rough test. Ok now let’s use ionised hydrogen at around 10 000 K which equates to around 13 km/s. Now hit 3500 gamma again, that has us at around 750 000 km at A.C which is still better than a laser! If we used ionised lead it would be 50 000 km. Now it is unlikely we will need to accelerate the craft all the way to AC, we would probably only need to accelerate to Saturn or Neptune distance which lowers the dispersion angle to a much smaller value. Electrons due to their light masses are a pain, they would need a much higher gamma that is for sure, could they be fired first to draw positive charges away from the launch corridor I wonder? Next planned particle accelerator 100 TeV, 50 000 -100 000 Gamma! Essentially, it is this, in all aspects of journeys between galaxies no one seems to have thought of the idea that if you’re moving at a significant fraction of lightspeed aberration will change your perspective in the sense of optical information. What of it you say? Well, it simply this : if your targeting your galactic encounter you might very well have problems upon arrival to the star system in the galactic system. The reason being that this would occur is the fact that the whole time you are optically scanning your target as you approach it you are seeing what the galaxy looks like from a long time ago, not what it looks like actually if this moment in time. For example, if you are heading to the Andromeda galaxy you’re looking at the start of a journey at what the Andromeda galaxy look like 2 million years ago, not what it looks like it present time. The problem here is that as you approach it, you’re still seeing it as it appears in the past. What if you are heading into a star system (or systems) in which violent catastrophic events are occurring? At that point it’s a little late to be attempting course corrections or what have you. What say all of you? As you speed towards the gallaxy far, far away the information you get increases due to the velocity component, think of red light (low frequency) been shifted to the blue end (higher frequency). So you will be catching up, time wise (speeding up) and the stars will seem to be increasing their velocity in their frame of reference, so you just need to make course corrections on the move. You will arrive there, if you travel at a hair short of the speed of light as the light left them. Unless I have got it all wrong of course! I’d be interested in how you would plan to extract the momentum from a 3500 gamma proton beam to push your ship. No sail or reasonable magnetic field will do that, I am pretty sure. Much less with a cross section of many square kilometers…. The only way possible is to use a powerful magnetic field to absorb the incoming charged particle’s momentum. As the charged particle encounters the magnetic field it will gyrate and create a magnetic force that opposes the spacecraft’s magnetic field. These powerful magnetic fields are routinely used it the LHC. Yes, but those LHC fields require very heavy equipment and are only centimeters wide. To stop those beams you would need fields just as strong, but extended over a vast volume(*). There is no equipment that can do this. A neutron star might do it, but that would be a bit too heavy to serve as a sail. (*) The field needs to be as deep as the diameter of the LHC (many kilometers), and as wide as your beam diameter at the far point of your acceleration range (thousands of kilometers? ), and as strong as that of the LHC (a couple of Teslas?). 3.5 billion km acceleration range. We will have a 7 020 000 km dispersion distance at end of the acceleration time phase with a 10 000 K proton gas temperature (~no gamma). Now we apply 3500 gamma on the protons. So we have the maximum size at the end of acceleration, which is ~2000 km or 2 km wide if ultra-cold gas plasma is used. I am not certain, but I think the type of coil in the LHC uses much more volume for the conductor than there is for the field. I also suppose the two are linearly related, i.e. you want to double the volume of the field, keeping the strength constant, you need double the volume of conductor. You can quickly see that your proposal is unworkable at full field strength. I am not sure what happens to conductor volume when you reduce the field strength, but I am sure that the depth of the field needs to go up linearly, e.g. using half the field strength you need a distance of double the size of the LHC for it to turn the particles around. Ithaca attorney wants day to celebrate Carl Sagan meeting Neil deGrasse Tyson. Who’s in? Ithaca, N.Y. – It’s been almost 40 years since Neil deGrasse Tyson and Carl Sagan first met in Ithaca, someone texted Mayor Svante Myrick via a screen set up in the mayor’s City Hall office last week. “We should have an event and a celebration,” the text said.